As a keynote motivational speaker and author, I teach the principles of Vision-Mindset-Grit. Three simple, yet powerful words when put into action can help you reach your goals, turn setbacks into comebacks, and push the limits of what is possible in both your personal and professional lives. Vision refers to the goals you have for yourself, your team, your organization and your career. Vision is also one of the most valuable assets we have. Why? It’s free, it’s powerful and it’s the beginning point to your next destination. Take a look at Michelle Wie who, at the age of 15, declared herself a professional golfer, signed $10 million in endorsement contracts and competed against the best male golfers in the world. Her outlook was one of unlimited vision. I believe the same outlook can be equally as inspiring in the business world. The founder and chief executive officer of Starbucks, Howard Schultz, had a vision that a premium cup of coffee delivered in a warm and relaxing environment would bring a premium price. His Vision had to do with creating change, as opposed to sitting down and waiting for change to happen, and do what his competition was not willing to do. His vision led to extraordinary success all over the world. So, here’s the thing. You can have the most thought-provoking vision for your life, your work and apartment complex but you need a strong mindset and grit to go the distance. Mindset is the continual mental orientation, preparation and actionable adjustment needed to meet oncoming challenges and changes you will most likely experience along your journey. It’s your mindset that creates a winning attitude, spurs you on to take action and helps you focus on what you can control. Grit is the day-to-day determination to discipline yourself to persevere and be resilient in your pursuit when you are knee deep in the trenches working to meet the expectations of your renters, as well as marketing your property and paying attention to the details (as tedious as it may be), from going over contracts, performing background checks to make sure your property is always in the best shape — and especially, when all else beckons you to retreat, fall back, give in or, perhaps worst of all, simply stay where you are. The next time you want to reach a goal, I’d encourage you to recondition your mind by implementing a technique I learned from my days of playing college football at Florida State University in 1983. The technique is called imprinting. Imprinting in this sense is seeing complete success in your mind’s eye, first. Always begin with the end in mind. See yourself conquering your next goal, as difficult, aggressive or impossible as it may seem. Visualize it, then repeat or imprint that successful outcome over and over again in your mind. When you imprint the image frequently, your subconscious mind can no longer tell the difference between your goal and what is real. Your vision becomes reality. By imprinting your goal into your subconscious mind, you develop an unstoppable mindset designed to do everything within its power to achieve whatever you tell it. This anticipatory approach can put you in a position to overcome your challenges, reach your goals and turn your ideas into reality. Imprinting helps to maintain your vision in spite of change and ongoing challenges. Remember, the brain believes what you tell it, so always strive to be positive. And in the words of Roger von Oeck, author of A Whack on the Side of the Head and A Kick in the Seat of the Pants, “It is easier to tone down a wild idea than it is to tone up a boring one.” So, the way I see it, we need to be dreaming in full color in all areas of our lives until our vision becomes our reality.Be willing to explore and implement the concepts of vision, mindset and grit into your life. Three simple yet powerful words when put into action can have a profound impact in your life, as it has in mine. 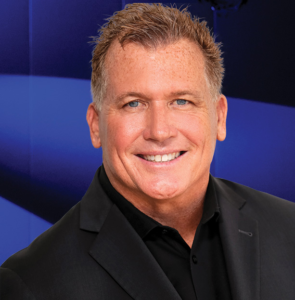 Burrows is a keynote motivational speaker and bestselling author, delivering presentations around the globe, sharing his compelling story of tragedy and triumph. Hear more from Scott Burrows at the Lunch & Closing Session on Oct. 10! Register now.